Apple has released the final version of iOS 10.3.2 for iPhone, iPad, and iPod touch. 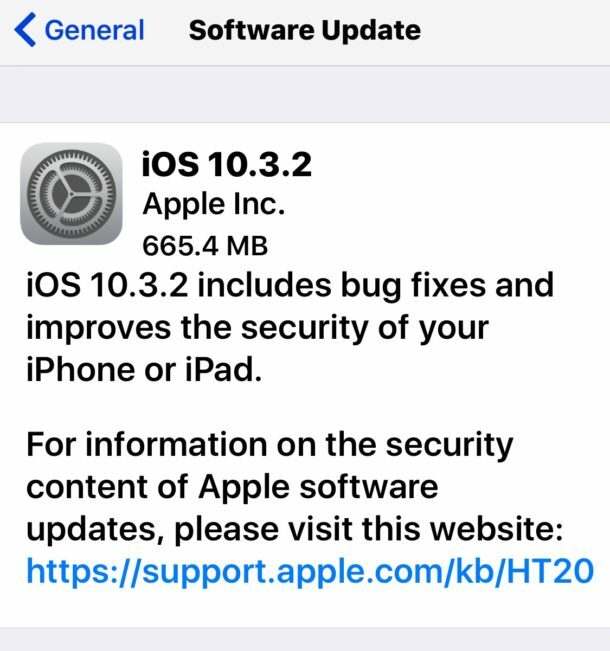 The small software update is said to include bug fixes and security enhancements for iOS devices and thus Apple recommends installing the update. Separately, Apple has also released macOS 10.12.5 for Mac, watchOS 3.2.2 for Apple Watch, and tvOS 10.2.1 for Apple TV. Always back up an iPhone or iPad before installing any software update. This is easily done through iCloud or iTunes. Do not skip a backup, despite being a minor point release update things could still theoretically go wrong which could result in data loss, a backup makes recovering from such an incident possible. iPhone and iPad users can find iOS 10.3.2 on eligible devices via the Settings app > General > Software Update. Choose “Download and Install” after you backup the iOS device to begin the installation and update process. Separately, watchOS 3.2.2 and tvOS 10.2.1 can be downloaded via the Software Update mechanisms for Apple Watch and Apple TV. Mac users will find Mac OS Sierra 10.12.5 update available in the Mac App Store as well. I assume this is the just-released iPad. I’ve never seen it referred to as an “Air 3”. Hi, I’d love to have an ipsw link to the new 2nd Gen iPad Pro 12.9″. I just received my new iPad today and want to have that file available. Do you know the link?